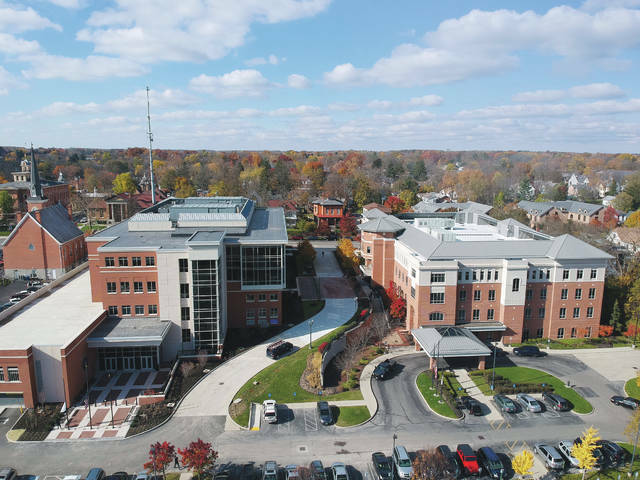 This is an aerial photo of the new Delaware County Courthouse on left and the Hayes Administration Building on right. County residents are invited to an open house at the courthouse at 3 p.m. on Sunday, Dec. 3. Delaware County invites the public to tour its new courthouse this Sunday, Dec. 3 from 2 to 4 p.m. The five-level courthouse, located at 110 N. Sandusky St. in downtown Delaware, opened for business Nov. 6. It now houses courtrooms for the Delaware County Court of Common Pleas, both the General Division and the Domestic Relations Division. It is also home to the Clerk of Courts, Probation Services, Public Defender Office, and Jury Assembly offices. Visitors will be able to tour public areas of the courthouse, plus enjoy what has been billed as “the best view in Delaware” from its glass-enclosed fourth and fifth levels. The open house coincides with Delaware’s annual Christmas parade, which starts at 3 p.m. and passes by the courthouse on its route down Sandusky Street from Mingo Park to Ohio Wesleyan University. Children are especially welcome to visit the courthouse and they will receive a special prize for visiting. The main entrance to the Delaware County Courthouse is accessed from North Union Street. Free parking is available in the ground lots next to the courthouse.